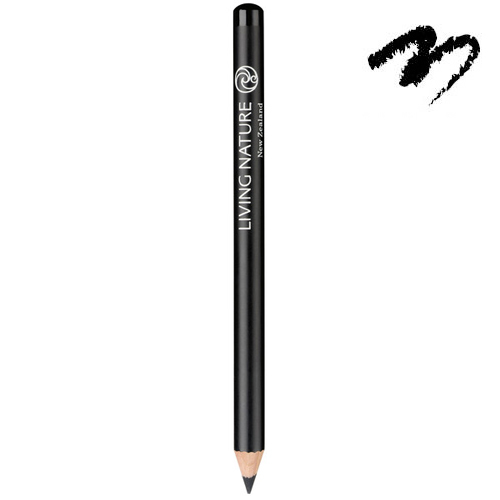 Living Nature Eye Pencil - Midnight is a soft, gentle pencil with vegetable waxes to provide smooth application and naturally occurring oxides to enhance and define eyes. Keep your pencil sharp, using the Living Nature Pencil Sharpener for perfect definition and precision with every use! Iron oxides (CI 77491, CI 77492, CI 77499), Hydrogenated palm kernel glycerides (palm kernel extract), Caprylic/Capric triglyceride (coconut extract), Hydrogenated vegetable oil, Hydrogenated palm glycerides (palm extract), Talc, Ferric ferrocyanide (CI 77510), Rhus succedanea fruit wax (fruit wax), Tocopherol (vitamin E), Aloe Barbadensis leaf extract, Macadamia ternifolia seed oil, Ascorbyl palmitate. Apply a thin line close to the eyelashes. Smudge the line for a natural, softer look, and to enhance colour. Wear alone or with eyeshadow, choose your selection from Living Nature`s range of gorgeous natural shades. Below are reviews of Living Nature Eye Pencil - Midnight - 1.14g by bodykind customers. If you have tried this product we'd love to hear what you think so please leave a review.